I WAS playing Texas Hold ‘Em with a bunch of younger guys a couple of weeks ago in my favorite poker joint and one of them was delivering a spirited rendition of Bruno Mars’ “Nothing on You” (yes, this old fogey knows the singer and the song)—probably to disguise a pair of Kings—and the table talk came around to our preferences in music. I have to say, I almost lost it at that point. I pride myself at the table on my poker face, a point my adversaries readily concede—“You can never tell what hand Daddy Butch is holding!”, I’d often hear. But that fearsome inscrutability more likely comes from the fact that, at the freewheeling 10-20 cash game, I’ll bet on anything from a pocket pair of Jacks to a 7-deuce off-suit. In others words, I’m what they call a “loose and aggressive player,” possibly mad, possibly idiotic, possibly serious. I lose a lot of money playing this way (I behave much better in tournaments) but it’s worth the sight of my tablemates guessing and squirming. “Bigger than Nirvana?” someone else chimed in. “Really, they said that? When? “Sure—they had a big concert here on July 4, 1966—and I ALMOST saw them!” The bile had snuck down my throat now, and I was feeling much better, given a rapt audience for one of my favorite stories. With full relish, I recounted how the Fab Four flew into Manila, were met by screaming, fishnet-stockinged girls, offended Bongbong Marcos, and were practically chased out of the old MIA by Liberace fans who clearly believed that—at least in the Philippines—the Beatles couldn’t possibly be bigger than the Marcoses. My poker playmates look at me with wide-eyed wonder—I try to read their faces, like a a poker player ought to be be able to do—but I can’t tell if they can’t believe that I’m that old, or if they’re just awed to be sitting at the same table with someone who actually breathed the same jeepney-flavored air in the same politician-infested city as the lads from Liverpool. 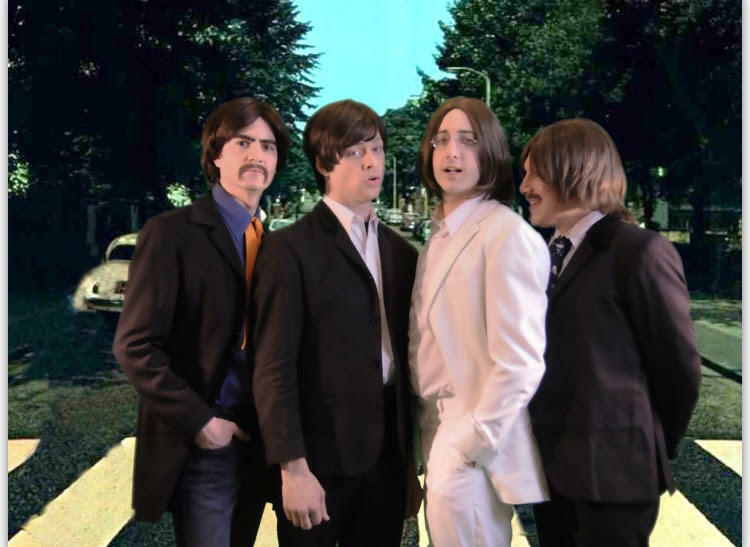 They got nothing on you, Beatles! 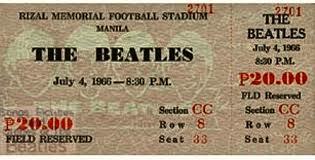 AND IF these memories make you feel like suiting up in your collarless jackets and zippered boots and swaying to “Eight Days a Week,” you’ll get a chance to relive the Beatles experience when one of Britain’s finest Beatles tribute bands—called, well, Britain’s Finest—come to Manila for a concert on October 14, Wednesday, at the tent of the Midas Hotel and Casino on Roxas Boulevard in Pasay City. You can get your tickets (P3,800 for the VIP and P2,800 for the gold section at all SM Tickets (470-222) and TicketWorld (891-9999) outlets or via www.ticketworld.com.ph. I’m planning to go, but I think I’ll leave my mom at home this time. This entry was posted in Art & Culture, Family & Me, Fun, Pinoys and tagged 1966, Beatles, Britain's Finest, Philippines, tribute by penmanila. Bookmark the permalink.